Category: Body Care. Tag: €10 & under. The world is constantly searching for the one thing that will explain why we’re all here. the meaning of life, if you will. well, we’ve gone and discovered it. the reason you are on this planet (this dull old planet, where it rains more than it should and is never sunny enough) is to experience the joys of our instant + self tan mousse that gives you a beautifull golden glow. when those little green men from other universes visit, just imagine how incredibly jealous they are going to be of your magnificent browness. Get a golden tan in seconds. Lightly fragranced to avoid that biscuit tan smell other products can give you. Only lasts until your next shower. 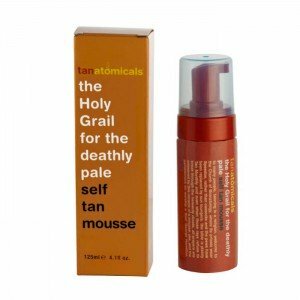 Get a golden tan in seconds with this Anatomicals Holy Grail For The Deathly Pale instant self tan mousse. Gradually developing into a natural looking tan without leaving any streaks whilst moisturising your skin. Lightly fragranced to avoid that biscuit tan smell other products can give you. The Holy Grail for the Deathly Pale – No strong smell and dries instantly. The Holy Grail for the Deathly Pale only lasts until your next shower.